Set up your own NAS server with the 5N2 5-Bay NAS Enclosure & 12TB IronWolf 3.5" HDD Kit from B&H. This kit includes a Drobo 5N2 5-bay enclosure and five 3.5" 12TB 7200 rpm SATA III NAS drives for a total raw capacity of 60TB. Moreover, the enclosure supports multiple RAID configurations for performance and data redundancy. Designed for data sharing, secure backups, remote access, and disaster recovery solutions, the 5N2 5-Bay NAS Enclosure from Drobo is equipped with five 3.5" SATA drive bays that support SATA III (6 Gb/s) and SATA II (3 Gb/s) drives. It distinguishes itself from the original Drobo 5N through the inclusion of an additional Gigabit Ethernet port, for a total of two. These two ports provide bonding support, also known as Adaptive Link Bonding, for link failover and aggregation without Ethernet switch support. The 5N2 also features an upgraded processor, Drobo Disaster Recovery, and an improved battery to help protect data in the memory or cache in the event of a power loss. To help complement the speed of Gigabit Ethernet, the 5N2 has been built with Drobo's Accelerator Bay, which uses a separately sold mSATA SSD to boost system performance. It accomplishes this by caching the data that is most often read or written onto SSD storage. 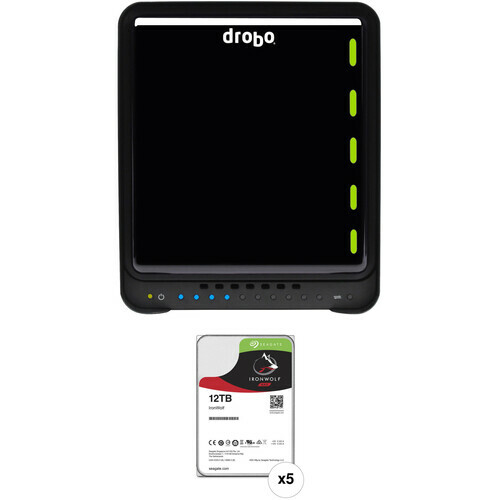 To facilitate data protection, Drobo's Disaster Recovery allows you to set up a pair of 5N2 units to automatically make an offsite copy of your data, including user account information, helping to ensure data availability in the case of unforseen circumstances. Additional protection is accomlished using Drobo's BeyondRAID technology, which enables single or dual-drive redundancy. If there are any empty drive bays, BeyondRAID allows additional drives to be inserted into the array, where they would be automatically configured. If all drive bays are occupied, simply replace the smallest capacity drive with a larger one and BeyondRAID will handle the rest. BeyondRAID is also what allows drives of varying capacities to work in the same unit, which helps enable future expansion as larger drives become available. The Drobo 5N2 is compatible with Windows and Mac, including APFS and macOS High Sierra. It includes two 6' Ethernet cables and a 6' power cord with a power supply that runs at 100-240 VAC ~ 2A, 50-60 Hz. Protection is provided by a limited 2-year warranty. Usually reserved for larger enterprise-class storage solutions, the Drobo 5N2 gives you the option to implement Hot Data Caching through the Drobo Accelerator Bay. This feature intelligently uses high-performance flash to accelerate performance, allowing faster access to your data. Drobo devices have always been space efficient and the Drobo 5N2 is no exception. It was designed to provide a high storage capacity without taking up a lot of desk space. It is compact because of Drobo's carrier-less drive bay design, allowing drives to be installed very close to each other. The 5N2 is also quiet due to its fixed, tuned, and large 120mm variable-speed cooling fan. Box Dimensions (LxWxH) 13.9 x 13.2 x 10.1"